Looking for the easy way to save your file as PDF? Go with this guide, please. PDF files has become most users’ choice for sharing files as PDF enables your friends or partners see exactly what you see on the file. Then how could you save you file in the PDF format easily？Don’t worry; we’ll give you the answer. 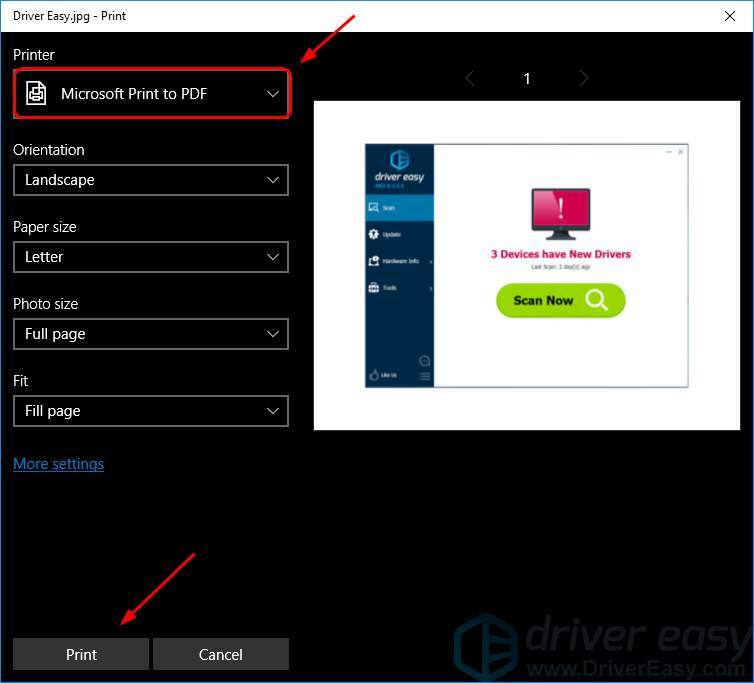 If you are a Windows 10 user, you can make use of the Microsoft Print to PDF built-in feature. 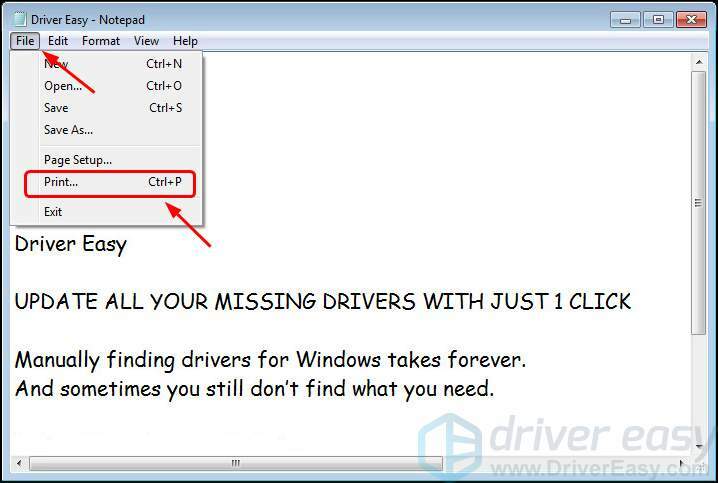 If you are a Windows 7 or other before Windows 10 user, try the Method 2. 1) Double-click your file to open it. For example, I want to print my image Driver Easy to PDF, so here I double-click the image to open it. 2) Your file should then be open. Find and click the Print option, it could be a text Print, or a print button like . 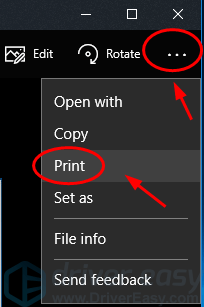 Important: If you cannot find the Print option on the window, it’s very likely locating in the More or File option. For example, my image is open in the Photos app in Windows 10, I should click the more option button …, then select Print. 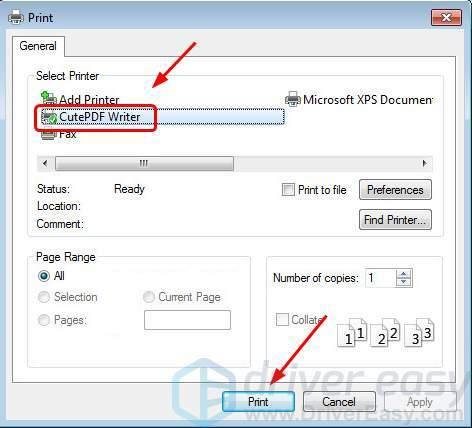 3) In the print settings page, set the Printer to be Microsoft Print to PDF, then click Print. Note: If you can’t find Microsoft Print to PDF or it stops working, follow the Microsoft Print to PDF Not Working on Windows 10 guide to solve your problem. 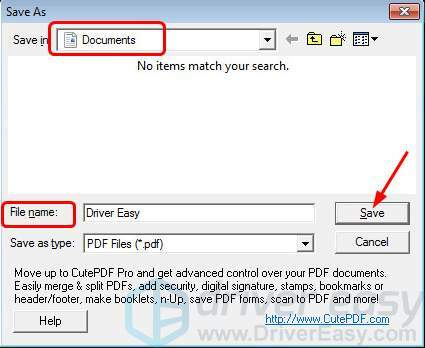 4) Select a place to you want to save your PDF file, then give it a name and click Save. If you’re using Windows those earlier than Windows 10, you then don’t have a buit-in PDF printer in your operating system. 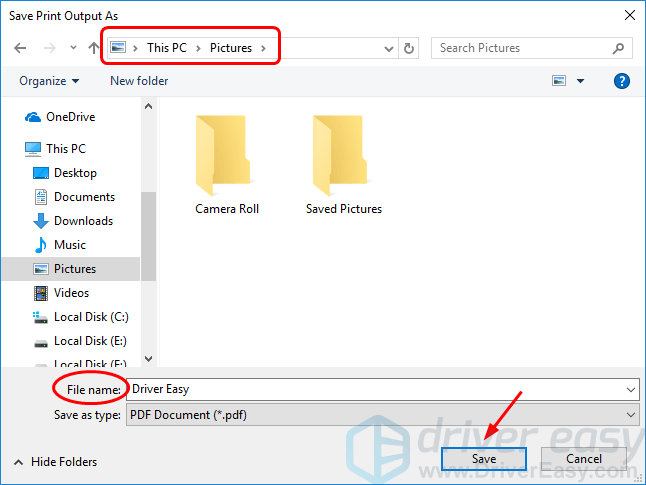 However, in order to print your file to PDF as easily in Windows 10, you can install a third-party PDF printer to help you. 1) Double-click your file to open it. For example, I want to print my text file Driver Easy to PDF, so here I double-click the file to open it. 3) In the print settings page, select the PDF printer you installed before, like I choose CutePDF Writer, then click Print. 4) Choose a place you want to save your PDF file and give it a name. Click Save. Above is the guide to print your file on Windows to PDF. If you want to save a webpage as a PDF file, use the built-in feature Save as PDF of your browser. 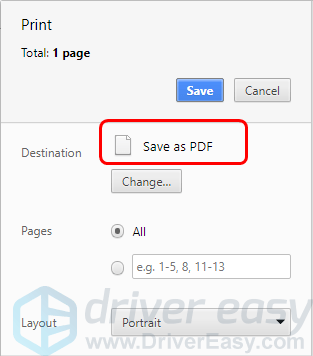 Like in Google Chrome, on the webpage you want to save in PDF, click the more options button, then Print, and then you will see the Save as PDF option. Please don’t hesitate to comment below if you have any questions.